My DH offered to buy a new Bernina 710 for Christmas, but I wasn't sure that's what I wanted. I teach classes at the Bernina store, so I've been using the 710 for classes and asking questions. And some of my students had new machines that the staff helped them with during class. Got way more exposure to the machine than any other I've purchased. There was some stitches on the 750 that I liked. Kept asking questions and thinking about what else I might want. As time went on, I kept adding to my list of "wish it could do this". Well, today, I was using the 750 in class. Never was interested in the embroidery unit, because I'm an artist and like to design as I go. But some of the new designs started me thinking of other uses for them. And the harp is 2" larger on the 830. Guess What! They had a used 830, completely refurbished at the factory for 1/2 price of the new one, making it very closely priced to the new 750. I've been saving up. So 6 months later I got my Christmas present. YEH! Going to a retreat next week and plan to spend the week getting to know her. And there'll be a teacher there who sews on the 830, so if I get stuck, I can get help. What to name her? What about Delayne for delayed Christmas gift? WOW!!!! Hope you enjoy your wonderful machine. How neat! Congratulations. That is the machine I've dreamed of since I first saw them. I have the Artista 730e. DH just doesn't "see" the need to upgrade. Mine does everything I want except for a larger embroidery field. Congratulations on the new baby. Tip. Keep her clean and she will work for a lifetime. Congratulations! I might name her delight because I would be delighted to get her. Congrats - what a lucky find. They are supposed to be great machines!! Lucky you! Such an awesome machine, and such a thoughtful hubby. One note of advice: when changing thread, clip it at the spool & pull it out through the needle area...NEVER backwards through the machine. 'Nina's don't like that. Enjoy! Congratulations on your new machine! I have the 830 and love it. Mine is named Phil. He likes to work every day. My little machine is named Ben. He is such fun machine - he goes to classes and my grandchildren get to sew on him. The very next day I did take Delayne to a retreat. I knew there'd be someone there who knew how to use it and I'm pretty good at a manual. Turned out pretty good. Did some FMQ and seams. Managed to bend one of the feet. Now it's breaking threads. The tech will be back from vacation next week, so I'll take it in. Tuesday, while teaching FMQ, one student had the 710 and I was able to help her. Yeh! Today, had my first real lesson. Got a surge protector for 1700 joules, and one for the TV and one for the computer. Living in the mountains, just never know when a tree will fall and cause serious power fluctuations. Also, got some more "D" for dual feed, feet. When it was back at Bernina for the used overhaul, they updated some things and even the staff didn't know yet what they do. The auto thread cutter wasn't cutting the bottom thread. Learned how to clean it (had a thread in it), works great. Then had some time with the embroidery expert. She digitized a quilting pattern for me. And I got to practice. We'll see how it does with computer quilting. So, guess what I'm doing tomorrow, besides laundry! I'm so pleased you're loving your new machine! I've been thinking about a Bernina for a while now and am going to try one soon. What I ended up getting wasn't what I origionally thought I wanted. As I looked and considered the 1 step upgrade, I'd think of how this could enhance what I do. As I taught classes and considered for 7 months, I finally decided I wanted it all. And there was a used machine. Take your time, it's a big investment. Good luck. woo hoo! big time machine envy going on here! That is a cute name. You are very lucky that you have such a loving DH!! Enjoy the fun!! I have two very old Bernina and I love them so much. 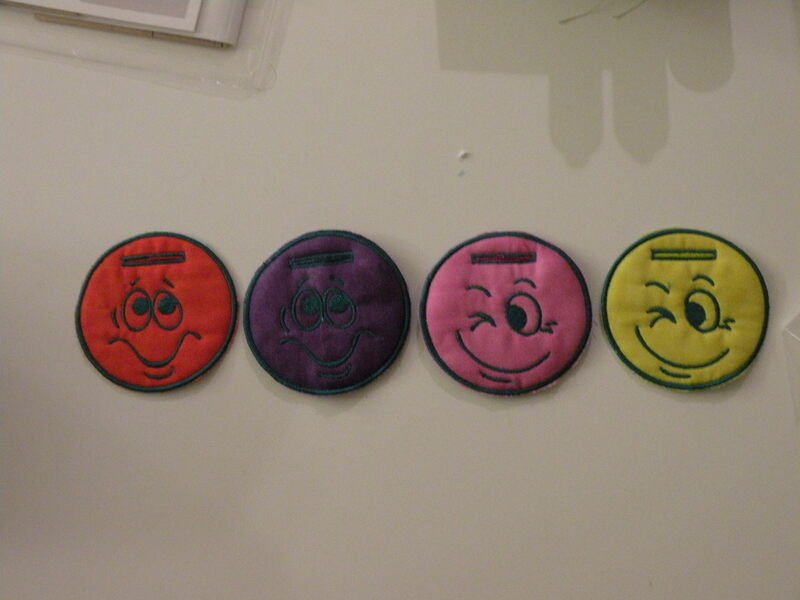 Went to embroidery club today. Wow. So much to learn because it can do so much. There's a new project every month. I think this will help my learning curve. Was there the longest and did the least it appears. Most of the doing is what's happening in my brain. Did learn it needs a very sturdy table. May need to rearrange the studio. Glad you have received what you wanted. Have fun! WhooHoo are you going to be having fun. I have a Bernina 640 and just added the embroidery unit. Really fun to play with. But I must admit most of our $$$ go to longarm quilting things like the Intelliquilter. Spend your $$ where your passion is! Congratulations. Congratulations on Delayne. I can't imagine how you managed to bend a foot! LOL, you are one serious sewer. I am thankful I never caught the embroidery bug, but my bug is equally expensive (Longarm!!) My Bernina is the 153 Quilters edition. Not near as many bells and whistles and I only use a fraction of what it can do! Can't wait to see you post pictures of your creations. The Bernina Dealer could understand how the machine could bend a foot-because it has so much power. What they couldn't understant is why it stiched where it did. On the learning curve. Today I was able to repeat last Saturday's embroidery class, by myself. I could find my way around the screens. I even was able to change to a different pattern and stitch it. Yeh! The first two pictures are luggage tags, front and back. 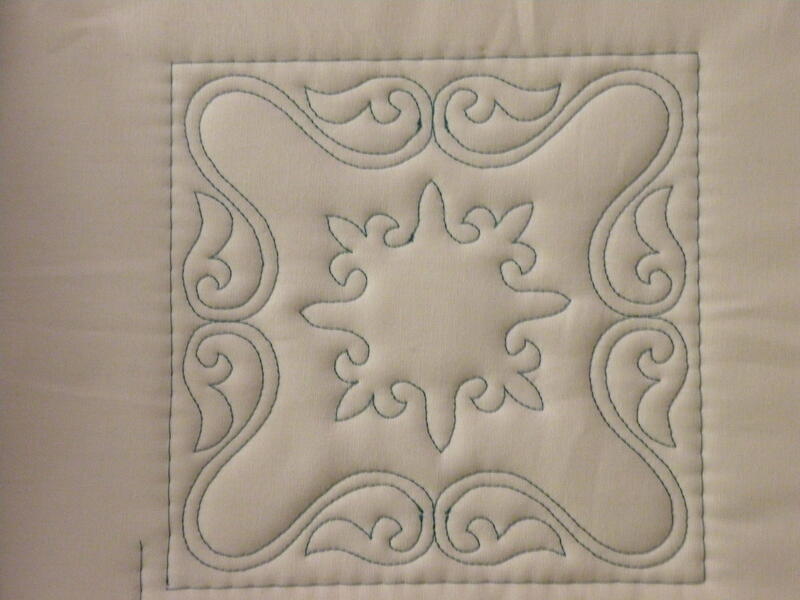 The last picture is a quilting pattern, stitched on the embroidery unit. I'm thrilled with what I was able to do today. This past week, spent 3 days at the dealer working on quilting the churn dash blocks of a quilt. Learned to support the quilt because the drag was too much for the embroidery unit to move properly, It had a warning light and stopped. Glad I was at the store because they were able to tell me right away what was wrong. Then as I was supporting the quilt, the quilt folded over the area of stitching and the machine wammed into the fold/foot. Broken needle and another bent foot. They were able to bend it back. Got a good lesson on making sure I got all the broken needle pieces. Then I learned how to set up each block with the embroidery template. Enlarged the stitch out and turned it 45% in the computer to have it set on each block the way I wanted. Used the back up window to reset the machine to continue stitching where the mishap with the drag and broken needle occured. I like this learning curve. Hit a problem and get an answer within minutes. Then get professional help to get going again. I'm liking this machine. And the dealer. They've been stellar. My 820 is named Big Momma. I love my machine, take the mastery classes if available. I have taken one so far, and feel much more confident already. NAME HER DELAYne, written just that way!! How wonderful for you to get such a great machine and be in a position to really learn all about her! Keep us posted. I have had my 830 Bernina for the past 4 years and LOVE,LOVE,LOVE it best machine I have ever had .